I'm posting this as a new topic, because it was originally posted as a comment I made in response to a new member introduction, and it seems like it should be a separate thread. Some members here and elsewhere have encountered M1 Carbine flip sights that are installed backwards. I just want to provide a historical perspective on this that may prove interesting to some. Flip sights were probably often installed backwards during production. Attention to detail in assembly can be a challenge, and if a flip sight were installed backwards, it probably didn't make a noticeable difference to an inspector, or the end user. This is where manuals and other supportive documentation can get really interesting. Here is a link to a post on the subject of backwards flip sights from 2011. There are at least 4 official WWII era reference sources where the rear flip sight on an M1 Carbine is shown installed backwards. The first is USMC filmstrip "TFS-6," covering "Nomenclature of the U.S. Carbine, Caliber .30, M1." I have this filmstrip in my collection, and it is available for download at the preceding link. The rear sight on page 10 of the filmstrip is installed backwards. FM 23-7, dated May 20, 1942, p. 2 (and arguably the line drawing on p.3), and TB 23-7-1, dated March 17, 1942, pp. 24-27, both show the taper of the aperture toward the shooter's eye. (Backwards) Incidentally, TB 23-7-1 also shows the rear sight installed correctly on page 5, on Inland M1 Carbine serial #18. It appears that the same Carbine has the sight installed incorrectly on pp. 26-27. I am not 100% certain it's the same serial number Carbine, but if it's not Inland serial #18, it's #15 or #16. Anyway, inconsistency is demonstrated within the same manual. Inconsistency is also shown in a "Base Shop Data - Small Arms" manual prepared by Rock Island Arsenal "For Distribution to the British Forces by British Army Staff, North America, October, 1943." (Rare manual) In the "Dismantling" section, sheet 6 of 8 appears to show the rear sight backwards in the "Dismantling of Barrel and Removal of Rear Sight" section. Later on that same page, it describes how to disassemble the rear flip sight to its component parts, and shows the sight in its correct orientation, even though it is disassembled. These are line drawings, rather than photos, as with the aforementioned FM and TB examples. In TM 9-1276, dated 5 June 1943, the taper of the flip sight aperture faces out, in the correct orientation, which appears to be the earliest, correct reference in a manual. The sight was later phased out. My assumption, and that of most others is that the aperture on the flip sight should be flat towards the eye, and the tapered portion of the aperture should face toward the target. Does anyone have evidence of that being officially documented anywhere, such as in a blueprint? One observation to corroborate your assumption is to observe type 2 and 3 adjustable sights, as well as Garands. The taper is on the downrange side, toward the target. Also, Riesch says the S always faces left for the base taper. How does that line it up? One observation to corroborate your assumption is to observe type 2 and 3 adjustable sights, as well as Garands. The taper in on the downrange side, toward the target. Also, Riesch says the S always faces left for the base taper. Good points. Regarding the base taper, I believe the aperture portion of the flip sight could be flipped by itself, with the base remaining in the standard orientation. Please correct me if I'm wrong in this assumption. In the Marine Corps filmstrip, is the whole sight installed backwards or is the aperture installed backwards on the sight? It's hard to say from what I can see and I'm guessing just the aperture was installed backwards. The serial number of the carbine appears to be 107888. Is that what you see? Great find of the filmstrip. I am guessing it was redone at some point and maybe became obsolete? Seems the filmstrips that were standard were 7 series. Did anyone point out the error in slide 3? It is on another slide but I do not want to make it too easy. I have observed several backward sights on early QHMC carbines. I am guessing they may not have left the factory that way, rather they loosened up and the operator found putting the sight in backward that the sight can be drifted in place and hold its position. This is just speculation and may have left the factory with the S to the right. The dovetail or the sight is supposed to be tapered, Maybe both? A member was working on looking into the blueprints. By having the S to orientate the base would ensure the alignment. On the sight window: It is my understanding that by having the opening forward it lets in more light. However, I have seen some precision sights with the taper to the eye. My thought is that if the sight aperture is too thick it could blur the light. Sort of like looking through a paper towel tube. If you do not look perfectly straight the view picks up the sides of the tube. Naturally, this is an exaggerated example. Interested in hearing others thoughts. Edit to add: FM 23-7 May 20, 1942, page two shows what I believe to be the Winchester prototype. the L sight was different. also look at the hight wood. I think the aperture is installed backwards on the sight base. The sight base also appears to have a lot of punch marks on both sides. I agree that the serial number is 107888. Printed materials, especially older and even new, can have reverse images. Now I am not saying that explains all of the backwards flips seen in the manuals, but it's a possibility overall. As far as backwards flips from the factory, I don't remember seeing a lot, just occasionally and sometimes it's the leaf that's backwards and the base facing correctly, other times it's the whole assembly. Btw, when I see one "wrong" it's often because Bubba "the Corrector" has been at work and the sight is phony, in fact it can be a tipoff to a corrected rifle as a whole. True about the reversing of images, but the photos in all the cited examples contain sufficient perspective to refute reversal. On the sight window: It is my understanding that by having the opening forward it lets in more light. My thought is that if the sight aperture is too thick it could blur the light. Sort of like looking through a paper towel tube. A thick aperture cuts down on the light thru the "tube". Physically what allows more light thru is the thinness at the aperture - that's why it's dished to remove material and still provide a sturdy sight. Facing the dish away from the eye minimizes detail which the brain must sort out to get a sight picture when time is of the essence and there's not a moment to lose. Handguard backward orientation on slide 3, and handguard groove identification on slide 11? Also, the the end of the sling looks a little frayed. Check out slide #27. Nope, not what I am looking at. Slide 5 and 7 both show the sling swivel on backwards. Slide 8 has something that could be considered possibly erroneous. @blackfish, you explanation makes sense. Wasn't there a very early WRA carbine reported with a backward flip sight that was on display at Cody, the Smithsonian or Springfield Armory.. ? Seems I recall a very early one like 1,000,001 (Olins') or close to it. Do recall seeing some WRA Prototypes with a different style rear leaf that had the 'Dish' toward the eye. In slide 8, is the piston missing? Look at slide 9 and see if anyone notices the issue. 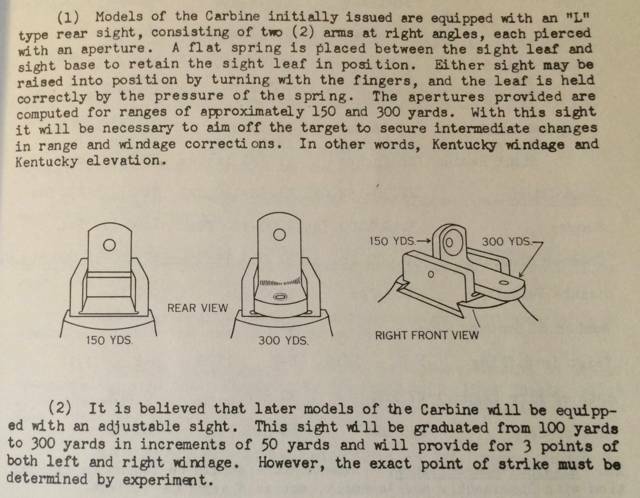 Here is the best illustration I've found among my Carbine paper items of the correct orientation of a flip sight. This is from the Camp Hood, TX Tank Destroyer School manual on the U.S. Carbine, Cal. .30 M1. Incidentally, this manual is undated, though it is very early, as it mentions that the Carbine was designed by Winchester, and was manufactured by General Motors Co., Inland Division, in Dayton, OH. It does not mention any other manufacturers. I believe the manual may pre-date TB 23-7-1 and FM 23-7. Good info. It's probably used elsewhere but I think this is the first time I've seen Kentucky windage used in an official document. Thanks for sharing.